When is a waterfall not a waterfall? The next time you’re in Yosemite, stop at the turnout where Cascade Creek meets Big Oak Flat Road and see if you can figure out why this impressive cataract doesn’t merit an official “waterfall” designation. It certainly isn’t for lack of verticality. Or drama. From the bridge on Big Oak Flat Road, Cascade Creek appears to spring full-speed from the heavens before taking a little twist and exploding into a network of violent, staircase cascades before disappearing beneath the bridge. You can cross the road and continue following the whitewater to its convergence with Tamarack Creek and its disappearance around a bend. I guess a waterfall by any other name looks just as sweet. 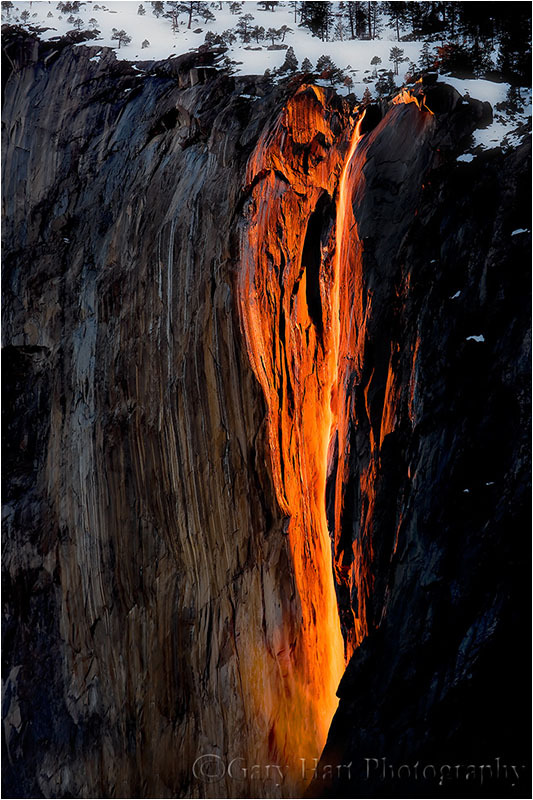 If you’re fortunate enough to get Horsetail Fall at the right time, it is indeed breathtaking. But how many more pictures like this does the world need? Of course when the light’s right, Horsetail Fall doesn’t need much water to become a breathtaking spectacle, and I’ll never tire of showing others the Horsetail “Firefall” effect for the first time. But honestly, given the shear drama and variety of compositions possible, I have a lot more fun photographing Cascade Creek. But let’s just keep it our secret. 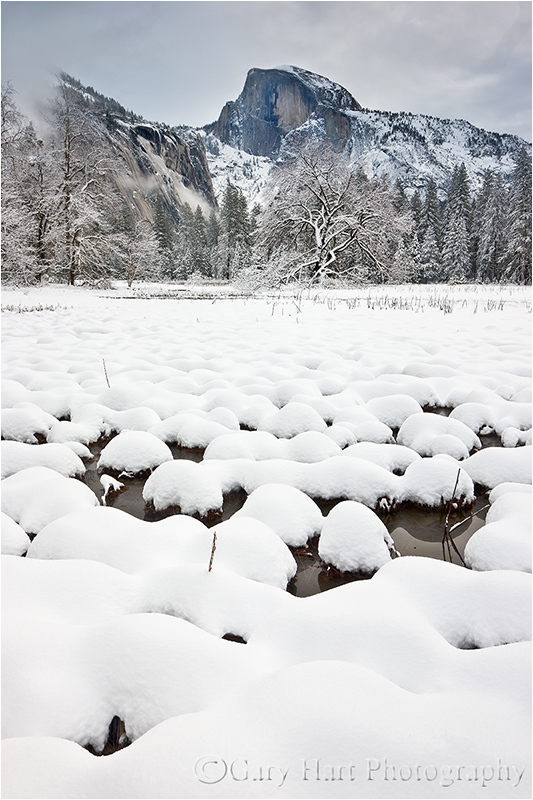 In any season Yosemite offers something that makes it special, but the most beautiful place on Earth is never more spectacular than when it’s blanketed with fresh snow. For a brief time immediately after a cold storm, every exposed surface for as far as the eye can see is brand new and pristine. Capturing this magic is all about timing. At just 4,000 feet, Yosemite Valley gets significant snow only during the coldest storms, usually just a handful of times each winter. And when the snow stops, the relatively mild temperatures (usually in the 30s), brilliant sunshine, and even the slightest breeze, conspire to clear the trees in a matter of hours. Meanwhile, park visitors driven inside by the weather, swarm outdoors to gape, quickly adding footprints and spreading mud with their boots, bikes, and cars. 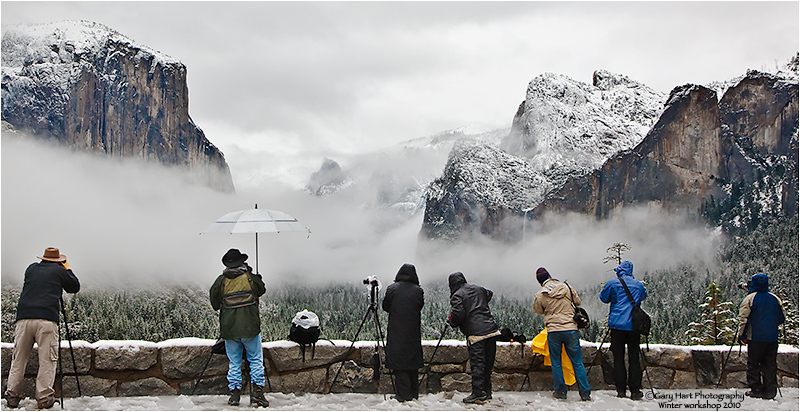 The key to photographing Yosemite with pristine snow is to be in the park while its snowing—if you delay your Yosemite departure until you hear that it snowed, you’re too late. It’s fun sharing this visual treat with my workshops, but because I must schedule these trips over a year in advance, there’s no telling what weather we’ll encounter. 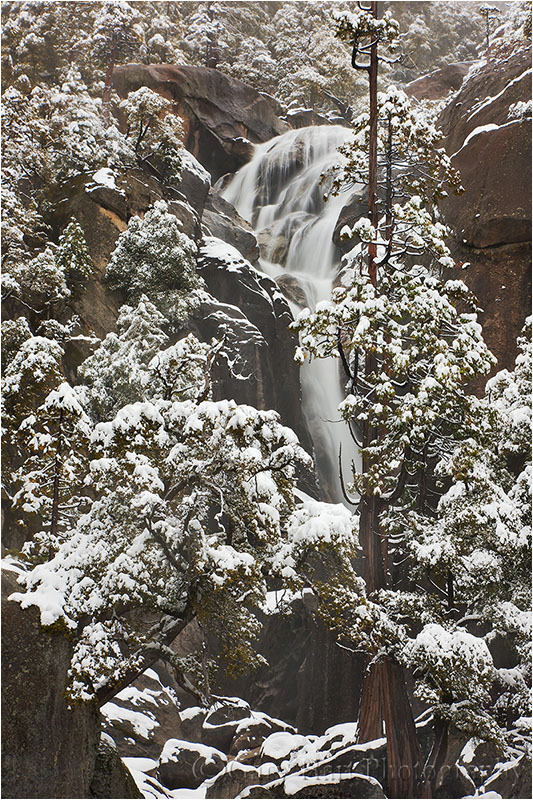 So imagine my delight when, after six weeks of dry weather and blue skies, Mother Nature cranked up Yosemite’s snow machine just in time for my 2011 Yosemite Horsetail Fall winter workshop. Each morning greeted us with scenes that seemed designed to outdo what we’d found the day before. Among my many snowy-Yosemite go-to spots is Cook’s Meadow. On this trip, until the snow arrived, the meadow was a field of lumpy brown grass, its sentinel elm a bare skeleton in the shadow of Half Dome. But six inches of overnight snow transformed this once bland meadow into an undulating sea of frozen white waves. Attempting to emphasize the snow, I dropped to my knees and found a vertical composition that leads the eye across the snowfield to the elm and ultimately to Half Dome. I minimized the brooding sky because, while interesting, it lacked the power to compete with the foreground. I should add that many in the group had signed up to photograph Horsetail Fall, but since Horsetail Fall requires clear sky for its fiery show, at the beginning of the workshop I advised everyone that Horsetail Fall wasn’t likely in our future. Some were disappointed at first, and a few were puzzled by my enthusiasm for what was in store, but by the time we finished, I don’t think anyone would have traded our experience in the snow for even the most spectacular Horsetail Fall shot. * This message isn’t for everybody. If your photographic pleasure derives from simply breathing fresh air and admiring the view, or if your camera is just an accessory that helps you share and relive those outdoor experiences later, you’re already a successful photographer. But if you aren’t achieving the results you long for, either in the quality of your images or the attention they attract, please read on. Albert Einstein defined insanity as doing the same thing over and over again but expecting different results. Hmmm. For some reason this reminds me of the thousands of good landscape photographers with hundreds of truly beautiful images they can’t sell. These photographers have a good eye for composition, own all the best equipment, know when to be at the great locations, and are virtual gurus with state-of-the-art processing software. Yet they haven’t achieved (their definition of) success. Conducting photo workshops gives me pretty good insight into the mindset of the most serious amateur photographers (the photographers serious enough to spend lots of money and vacation time for several days of sunrise-to-sunset photography). I’m frequently struck by the number of amateur photographers with serious aspirations who are so mesmerized by today’s technology that they’ve turned over control of the most important aspects of their craft to their camera. Their solution to photographic failure is to buy more equipment, visit more locations, and master more software. The tool they overlook is the one on top of their shoulders. Just as a new camera won’t make you a better photographer, simply upgrading your photography knowledge won’t do it either—knowledge is nothing more than ingested and regurgitated information. Understanding, on the other hand, (among other things) gives you the ability to use information to create new knowledge—solve problems. Many photographers invest far too much energy acquiring knowledge, and far too little energy understanding what they just learned. For example, it’s not enough to know that a longer shutter speed or bigger aperture means more light if that knowledge doesn’t translate into an understanding of how to manage light, motion, and depth with your camera. How a light meter determines the exposure information it gives you. This seems so basic, but auto-exposure and histograms have fooled many into thinking they understand metering and exposure. How to use the reciprocal relationship between aperture, shutter speed, and ISO to manage photography’s three variables: light, depth, and motion. This is the universal tool that enables photographers to handle the limiting factors of every scene. Books and internet resources are a great place to start acquiring these principles, but the knowledge you gain there won’t turn to understanding until you get out with your camera and apply them. When these principles become second nature, you’ll be amazed at what you’ll be able to accomplish with your photography. 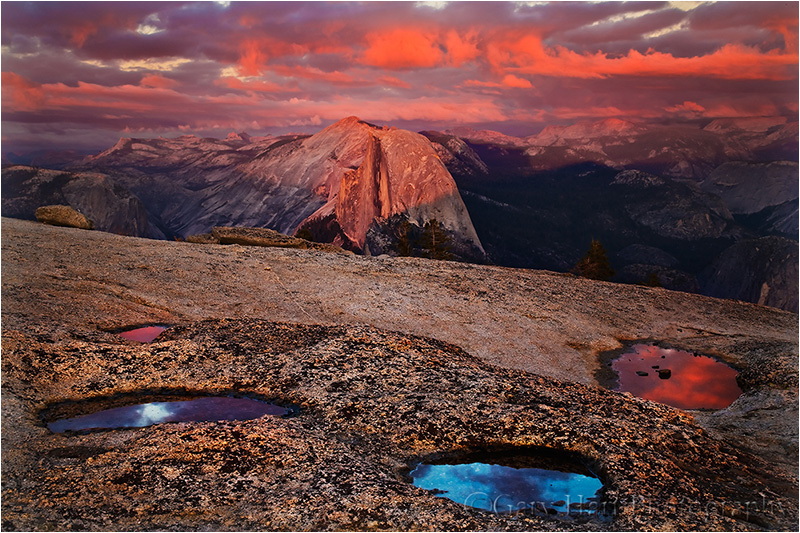 The image at the top of the post is from a visit to Yosemite’s Valley View last November. I chose it because it demonstrate how I applied the essential photographic principles above to accomplish my goal. 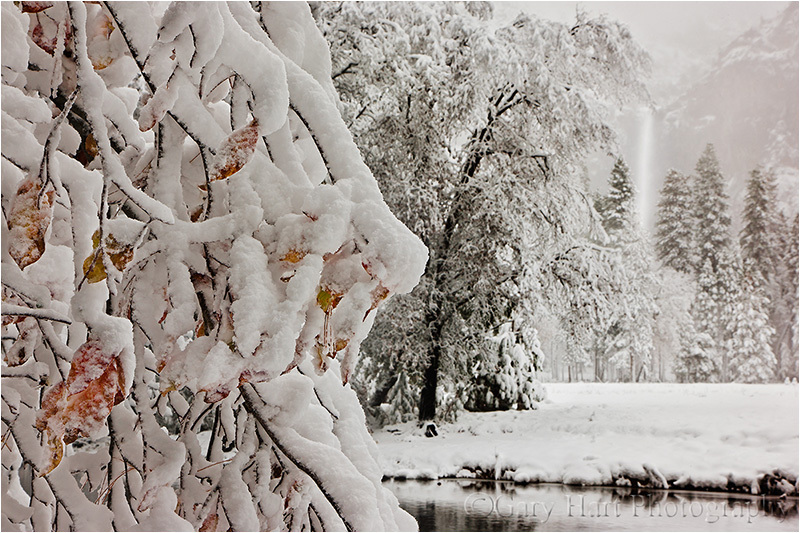 I arrived at Valley View that afternoon to find it blanketed with fresh snow—had I opted for the obvious composition, I’d have captured a gorgeous version of something that’s already been captured thousands of times. But I wanted something different, so I headed upriver a hundred feet or so to this dogwood I remembered from previous visits. (In fact, it’s the same dogwood featured in one of my favorite images.) I found that the sudden snow had caught the dogwood’s colorful leaves off-guard, leaving many still dangling from the snowy branches like frozen Christmas ornaments. The light in this scene was low but easy, with a very narrow dynamic range that fit easily within my camera’s range of capture. Because I was on a tripod, camera-shake wasn’t a concern; in the low light I only needed to worry about finding a shutter speed that would stop the breeze. Wanting lots of depth of field, but concerned about diffraction (from a too-small aperture), I decided f16 would give me complete sharpness in the leaves (essential), with just a little softness in the background and minimal diffraction. But f16 at my preferred ISO 100 resulted in a 1/8 second exposure that I feared wouldn’t be enough to freeze the swaying branches. So I bumped my ISO to 200, confident that I could make 1/15 work if I timed my exposure for a lull in the breeze (I was not at all concerned about the minimal noise introduced by the higher ISO). I clicked several frames just to be sure the breeze hadn’t introduced motion blur too small to detect on my LCD. If landscape photography gives you what you want, then by all means, continue doing what you’re doing. But if you’re having a hard time achieving a photographic goal, I suggest that the solution is likely not doing more of what you’re already doing. Instead, reevaluate your comprehension of fundamental photographic principles that you might not have thought about for years. You’ll know you’re there when you have complete control of the light, motion, and depth for every scene you encounter, know how to get the result you want or that it’s simply not possible. Yesterday NPR and Jazz24.org released their Jazz 100, “the 100 quintessential jazz songs of all time.” Topping the list was one of my jazz favorites, the Dave Brubeck Quartet’s “Take Five.” Listening to “Take Five” this morning I was particularly struck by the simplicity of its sound, and it occurred to me that simplicity is an essential and often overlooked element in photography. Spend a little time on photography websites and it’s easy to come away feeling visually assaulted. Saturated sunsets, crashing waterfalls, and swirling clouds can make wonderful photographs, but some of nature’s most divine beauty is best revealed by subtracting elements we’ve been brainwashed into thinking are necessary. Just as many of the pieces on the Jazz 100 are quite complex, simplicity is certainly not necessary for a successful image. But it seems many photographers have forgotten how effective a simple image can be. As my parents used to advise (shout), louder is not necessarily better. And neither is a lot of activity in a frame. To be effective, a scene’s elements (shape, color, lines, texture) need to work together; if they can’t, it’s better to isolate the most compelling aspect and remove distractions, no matter how beautiful they are. Case in point: A poppy-covered hillside is a beautiful thing, but so are the graceful curves and translucent gold of a single poppy. The poppy in the foreground of this image was just one of thousands blanketing a hidden hillside in the Merced River Canyon just west of Yosemite Valley. After photographing the entire scene I gradually moved closer until I found myself sprawled on my stomach beneath this one poppy. Conveying its simple elegance was all about removing distractions: rocks, weeds, and yes, even the thousands of other beautiful poppies in the background. In this case I used selective focus, attaching an extension tube and dialing up a wide aperture to limit the depth of field. Focusing on the poppy’s leading edge turned everything else in the frame to a smear of color. Did I achieve Brubeck’s mastery of my world? I think not—but it’s nice to have something to aspire to. You’re wandering the banks of the Merced River in Yosemite near sunset when, without warning, El Capitan emerges from a swirl of clouds; at your feet a mirror reflection of the scene mingles with smooth granite rocks. Bringing your camera to your eye, you find the composition that works best is a 30mm vertical frame. But keeping El Capitan and the foreground granite sharp requires f16. Hmmm. In the fading light, at ISO 100 the meter suggests 1/2 second. Even with image stabilization that’s a bit of a stretch at 30mm. Unfortunately, your tripod is a) strapped to your camera bag (a misdemeanor); b) in the car (a felony); or c) at home in the closet behind the tux you haven’t worn since your first wedding (a capital offense). So you bump the ISO to 400, dial the aperture to f11, and push the shutter speed to 1/16 second. Your finger is poised on the shutter-release when from behind a tree you hear, “Tripod Police! Step away from the camera!” Uh-oh. Fortunately, the Tripod Police are a kinder, gentler force. Their objective is not to punish, it’s to rehabilitate. As a fully deputized tripod officer, I must say that in my workshops I’ve cited more than a few tripod offenders. Of course it’s all in good fun–some workshop participants repent on the spot, others just laugh and wave me away. And while I’m really (I swear) not offended when they choose to forego their tripod, I do think it’s important that they understand what they’re giving up. Disclaimer: The tripod comments that follow aren’t directed at the many for whom nature photography is simply a great way to spend time outdoors and record those memories–if using a tripod saps the pleasure from your photography, leave the tripod at home. But if your photography pleasure derives from capturing the best possible images of nature, or if you aspire to make money with your photography, no single piece of equipment will improve your results more than a tripod. In this day of image stabilization and improving sensor sensitivity, satisfactory results can often be achieved through careful hand-holding. But most photographers love printing their images large, the larger the better, and a large print is an unforgiving reproduction that reveals even the tiniest flaws. No matter how steady your grip, the steadiest hand-held image will never be sharper than it would have been with a good tripod. Stability problems are even more pronounced in the limited light conditions (such as sunrise, sunset, and stormy weather) that landscape photographers crave. Achieving hand-held sharpness in anything but the harshest light means resorting to image-degrading compromises like higher ISO or a larger than ideal aperture. The flaws introduced by these compromises are sometimes not visible in a 4×6 print or 6×9 72-dpi Flickr gallery. But let’s imagine that your father-in-law has requested a 24×36 print of the pride of your portfolio–a hand-held, 400 ISO Grand Canyon sunrise that looks great in your Flickr gallery–for his law firm’s reception area. (A real coup after that whole llama farm investment fiasco.) What do you tell him when he asks if you can do another one that’s not so “mushy” and doesn’t have all that “sludge in the shadows”? Oops. A tripod provides a rock-solid foundation that removes image degrading compromise from ISO and aperture choices. A tripod simplifies your decisions in the field because you no longer need to decide between a potentially soft image and an image with extra noise and/or reduced depth of field. I have no problem increasing my ISO when there’s motion in the scene (flowing water, blowing leaves, etc. ), or opening my aperture when I want to minimize DOF. But why would I compromise my image quality, even slightly, with a higher ISO or larger aperture to minimize motion introduced by me, when my tripod will completely eliminate that motion without compromising quality? As a professional, I never know how large an image may need to be, so I can’t afford to compromise the quality of my images, not even a little. I don’t really care that in today’s cameras ISO 400 is almost as clean as ISO 100, or the DOF at f8 is almost as good as it is at f11. There’s an ideal f-stop for every capture. Really. For many this ideal f-stop concept is the lightbulb moment that becomes the tipping point in their appreciation of their tripod’s value. Determining an image’s ideal f-stop is essential to the creative process. It’s a moving target based on the depth-of-field the composition requires, and the aperture at which the lens is sharpest. The ability to manage a scene’s front-to-back component by creating the illusion of depth separates successful landscape photographers from everyone else. Sometimes a scene calls for maximum DOF, sometimes minimum, and sometimes something in-between–regardless, good photographers know that every composition has only one aperture that returns the result they seek. Put simply, in a static scene (no moving subjects), a tripod allows you to base your f-stop choice entirely on what the scene calls for; if depth isn’t a factor, you should choose the f-stop at which the lens is sharpest. Still not convinced? Consider also the control a tripod gives to your composition process. It slows you down (a good thing), making it easier to consider each element in the frame and its relationship to the other elements. Combined with depth of field management, careful management of the elements in your frame is the part of photography that separates the art from the snapshot. Before capturing any image, I look for distractions on the side of the frame (objects cut off or intruding), merged elements at different distances (that rob the scene of depth), and attempt to achieve general sense of visual balance throughout the frame. Next I carefully determine the ideal focus point (selecting the ideal f-stop has little value if your focus is off). Having my composition locked in place on my tripod enables me to ensure my focus point is precise, and when necessary, makes it easy to check depth of field with the DOF preview button. After capture, I study the histogram and composition for any possible setting adjustments or composition refinements. Sometimes it helps to step back from the camera and imagine the image on the LCD framed large, on a wall. With a tripod I can do all this at my pace, sometimes through the view finder, other times scanning the broader scene. When I’m ready, the original image is still sitting right there, exactly as I just captured it. Advanced digital techniques image such as image stitching (for panoramas or high resolution capture), HDR (high dynamic range blending of multiple images for exposure management), or focus blending to increase depth of field are all difficult to impossible without a tripod. As is mirror lock-up to reduce mirror-slap induced vibration. I’m rarely interested in photographing when the light is bright enough to allow uncompromised hand-held capture. While I don’t usually photograph in midday sunlight, I make exceptions when my subjects are backlit and the brightest thing in the scene. Flowers work great for this, which is why I was poking around on the banks of the Cosumnes River on a sunny afternoon last spring. 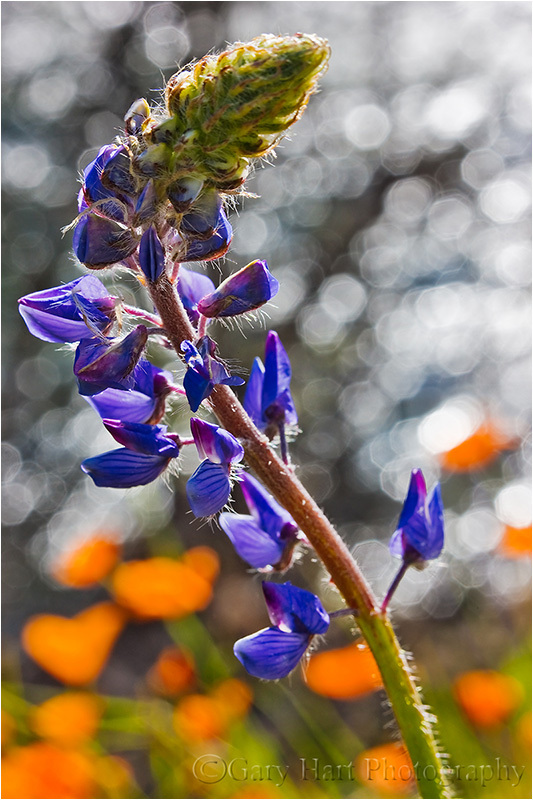 And even though these flowers were brightly lit, without my tripod, I wouldn’t have been able to achieve my objective. To turn the sparkling water drops to effervescent sparkles I needed f16, but that small aperture gave me enough depth of field to make the background too busy. So I twisted on a couple of extension tubes (at the expense of the several stops of light) to sufficiently soften the background. Since the meter’s suggested 1/20 second at ISO 100 was not fast enough to freeze the lupine in the slight breeze, I bumped my ISO to 400. The resulting 1/80 second shutter speed was still too slow for hand-holding, but was enough to freeze the lupine if I was careful. Focus is particularly critical in macro photography. With my composition locked in place on my tripod, I used live-view to magnify my designated focus point 10x and carefully dialed it sharp. With my composition in place I stood back and waited for a lull in the breeze before clicking my remote release. And because the composition was sitting right there in my viewfinder, the tripod further facilitated my composition process by allowing me to study the LCD and further refine the composition after each click. I took five frames of this composition, each slightly different than the others. If I follow the progression of the frames, I can see that each was a slight improvement over the previous, an incremental improvement that would have been nearly impossible without my tripod. Just as the llama farm is now dust in the Peruvian desert (just checking to see how carefully you’ve been reading), all those beautiful hand-held scenes from your unstable past are gone. Fortunately, the Tripod Police offer a wonderful amnesty program that rewards rehabilitated offenders with great new images each time they use a tripod. Just give it a try, and allow enough time for the tripod to become habit. Once you see the improvement, I don’t think you’ll relapse. Photographers tend to get so wrapped up in their picture taking that they fail to appreciate what’s unfolding before their eyes. Because this happens to me too, I’ve learned to step away from my camera when the magic is happening and allow myself to appreciate that I may be viewing the most beautiful thing happening on Earth right now. I had several of these “most beautiful” experiences with my Death Valley workshop group last week. We spent three days in Death Valley, then drove 100 miles up the road to Lone Pine on Friday. During the workshop we photographed two moonrises and three moonsets, each above some of the most unique scenery on Earth. Dramatic skies have a lot to do with my magic moments, but I’m afraid Death Valley’s chronic blue sky can make things pretty boring overhead. One reason I schedule the Death Valley workshop for mid-winter is to maximize the possibility of clouds (and minimize the possibility of crowds). But even in January the Death Valley skies are often devoid of character; to compensate I schedule the workshop to coincide with the full moon. Last week we had a few clouds, but the real highlight was the moon. We started with a sunset moonrise over the dunes, followed by sunrise moonsets from Zabriskie Point, Badwater, and the Alabama Hills (Mt. Whitney) on consecutive mornings. Before the Zabriskie sunrise shoot I had calculated that the moon would drop behind the Panamint Range, perfectly aligned with Manly Beacon, about five minutes after sunrise. This put the moon in the pastel twilight-wedge glow just as the foreground was bathed in sweet, shadowless light of dawn. Of course all the planning in the world is worthless if the conditions don’t cooperate, but we were fortunate that morning, and I can’t imagine any other place on Earth I’d have rather been. So why is it that so many nature photographers with grand aspirations spend so much time trying to duplicate the shots of others, rather than trying to find and refine their own artistic vision? Using Eric Clapton as a model for your music is great—the more you listen to Clapton, the more your guitar playing will be influenced by his craftmanship. But at some point you need to choose between carving your own musical path or languishing in anonymity. This applies equally in photography. In my photo workshops I encounter many people who have travelled a great distance to duplicate a photo they’ve seen online, in a book, or in a print. I certainly understand the impulse, and I can’t say that my portfolio doesn’t contain its share of these clichés. But, as I frequently urge my workshop students, if you must photograph something exactly as it’s been photographed before, make that version your starting point and not your ultimate goal. Once you get your “iconic” (that word is a cliché itself) shot, slow down and work the scene. Look for foreground and background possibilities, find unique perspectives. Play with depth and motion. If your original frame was horizontal, try something vertical, and vice versa. Take your camera off the tripod and pan slowly, zooming in and out as you go until something stops you (don’t forget to bring the tripod back before clicking). Still feel uninspired? Try a longer lens—often the truly unique images are tighter shots that isolate elements of the conventional composition. It’s true that the longer spend time with a scene, the more you’ll find to photograph. Make a mental checklist of the above steps (feel free to add your own) and go through them without rushing: Often the mere mechanical (uninspired) process of seeking something unique gives you deeper insight that leads to a creative capture if you stick with it long enough. 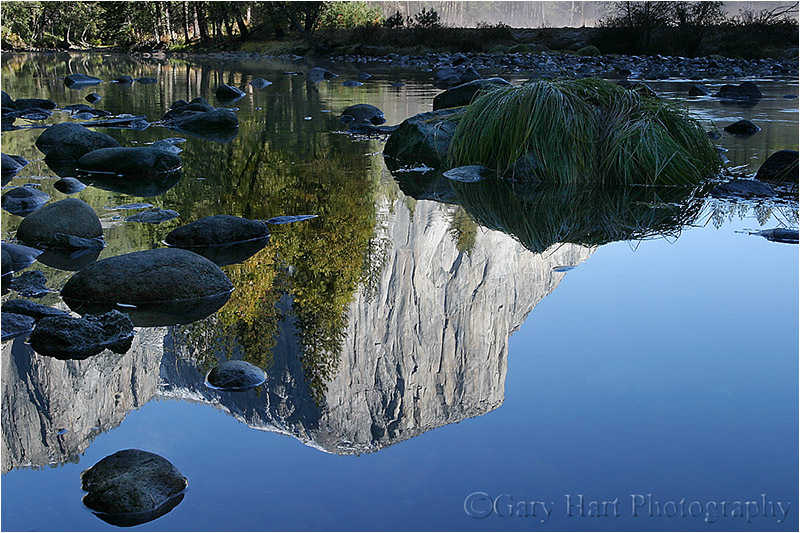 This image of El Capitan reflected in the Merced River resulted from just such an approach. I’d rolled into Yosemite at around 10:00 a.m. on a mid-November morning. The air was crisp and still, scoured clean by an overnight shower. At Valley View I found this perfect reflection, only possible in the quiet-water days of autumn. Working on a tripod, I started my compositions wide and captured many of the beautiful but conventional shots that have been done a million times here. But wanting something different, I removed my camera from my tripod continued probing the scene through my viewfinder. I eventually isolated the reflection, realizing it was so sharp the morning that it was the thing that really set this moment apart. Despite the advancing sunlight that would soon reach the river and wash out the reflection, I didn’t rush. On my computer at home, it was fun to view my process through the series of captures that morning. I finally zeroed in on this frame that has become one of my most successful images. Did I create the photographic equivalent of “Layla” that morning? Doubtful. But I did come up with an image that pleases me, and something that’s a pretty unique take on this heavily photographed location.